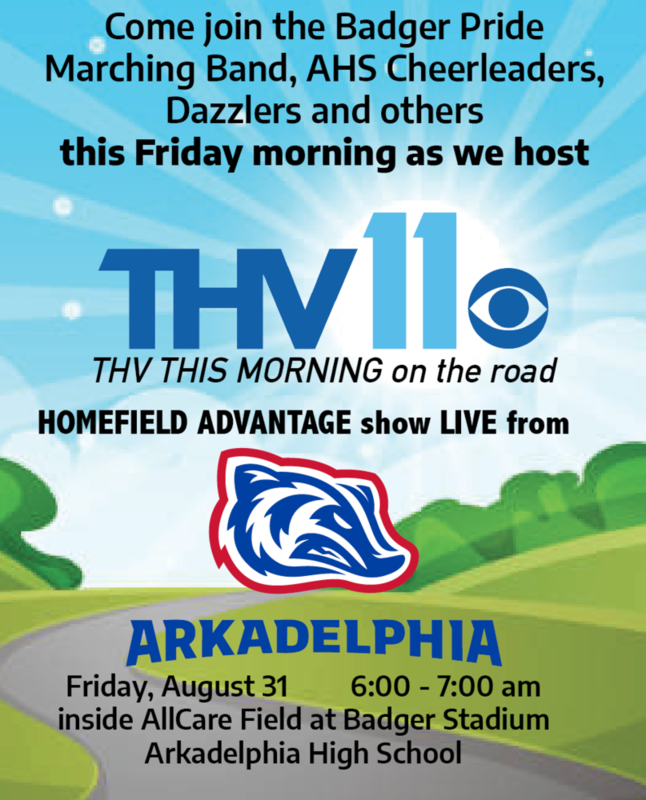 Arkadelphia School District students and families are invited to come join the AHS Badger Pride Marching Band, AHS Cheerleaders, Dazzler dance team and others this Friday morning, August 31, as APSD hosts the first “Today’s THV This Morning Homefield Advantage” show of the fall from 6:00 – 7:00 am inside Badger Stadium. The show, which airs on KTHV Channel 11, will feature interviews from AHS Badger Pride Marching Band Director Jim Lloyd, Badger head football coach J.R. Eldridge, Arkadelphia Promise Executive Director Jason Jones and more. The show will also feature AHS students, band, cheer and dance performances throughout the hour-long broadcast at different times. Those who plan to attend are invited to park in the AHS main parking lot and come inside the stadium down to the field in front of the band shell where the show will take place. All are invited to get up a little earlier Friday morning, put on your best Badger blue and come make the first Homefield Advantage show of the season for THV This Morning a tough one to beat the rest of the year!